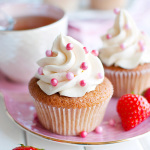 Time for cupcakes! 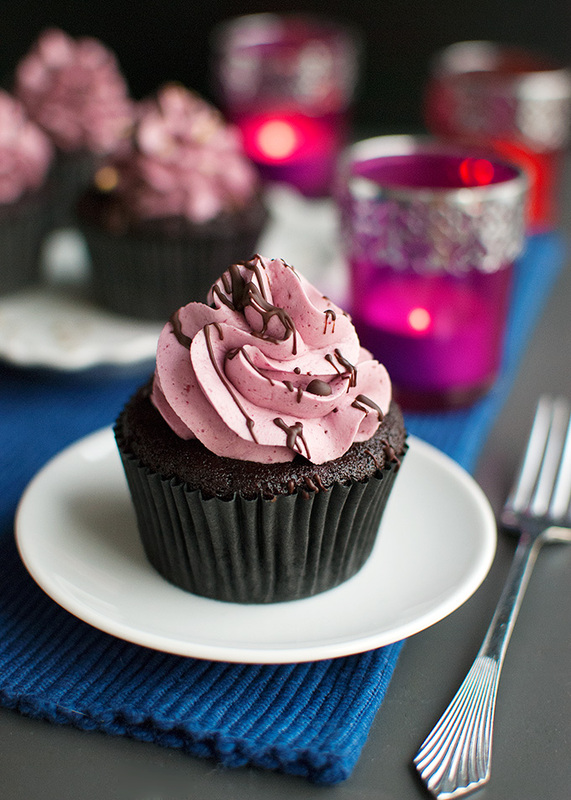 Delicious, decadent dark chocolate cupcakes filled with blackcurrant jam and topped with a generous swirl of cassis (aka: blackcurrant) buttercream. 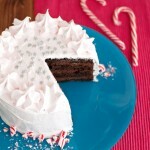 Oh, and a drizzle of dark chocolate. Because YUM! So there. 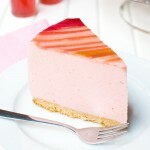 This is a great recipe for Valentine’s Day, if only I had the time to post it last week. Luckily, it’s cupcakes. 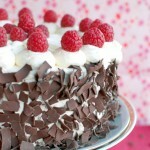 With chocolate and buttercream. Which means deliciousness no matter what day you make them. So why not the week after Valentine’s Day? Am I right? Who’s with me? Give me cupcakes any day! You guys read the post about the buttercream, right? 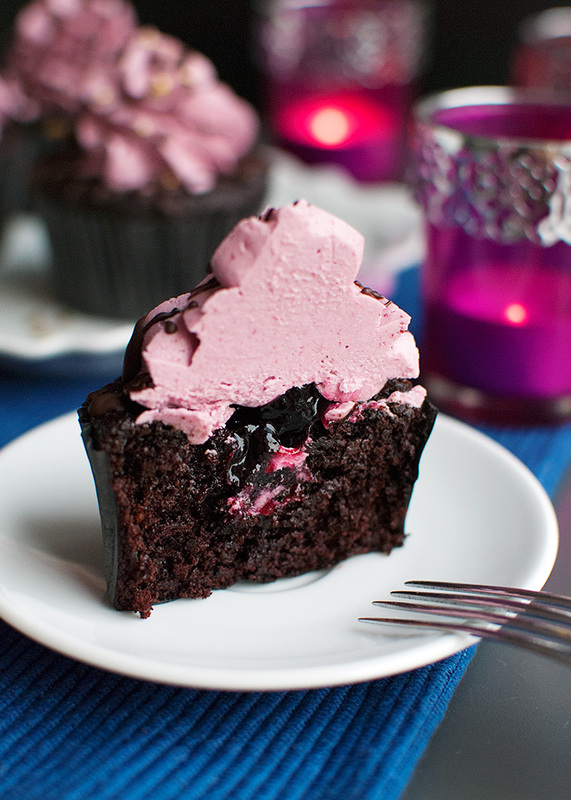 It’s Swiss buttercream flavored with strained blackcurrant jam. I used Bonne Maman jam, but you can use whatever brand you like. And if you don’t like blackcurrants, you can also use whatever flavor floats your boat. 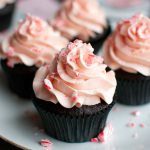 I think dark cherry or raspberry would also be great with these chocolate cupcakes! I, however, had my heart set on blackcurrants, because I was trying to make a cupcake version of a delicious chocolate I had a few years ago when the Rocking Rebel and I were attending a baking class at a patisserie: a dark chocolate shell filled with a cassis-flavored dark chocolate ganache. They’re really, really, really good. 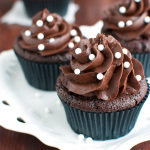 Better than all the other chocolate cupcakes in the world. For reals. They’re super easy to make. You don’t even need a mixer. I honored them with their very own post a while ago, because they are just so delicious. The post includes step-by-step instructions if you like some visual cues, but I hardly think you’re going to need them. It’s just throwing stuff together and whisking. 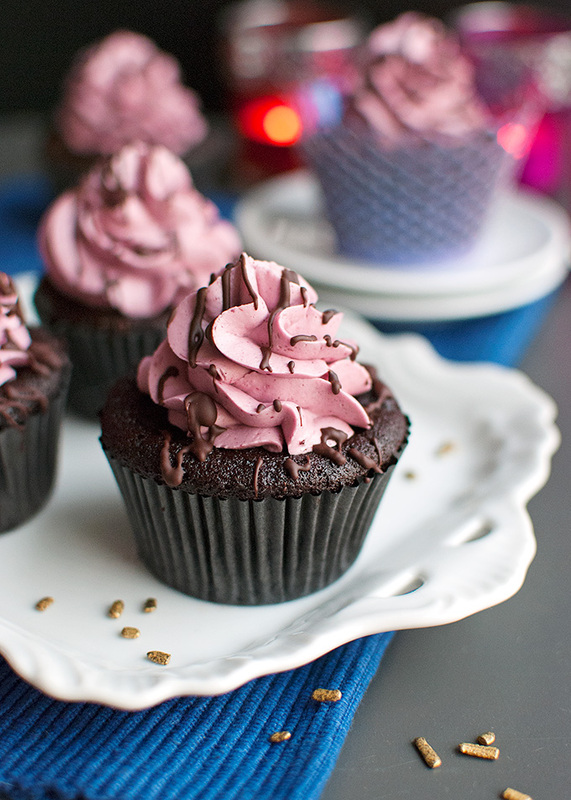 The dense, fudgy, moist chocolate cupcakes pair beautifully with the fruity cassis buttercream. But, of course, since I was making a cupcake version of a cassis-ganache filled chocolate, I wanted the cupcake to have a little fruity surprise on the inside as well. Enter more blackcurrant jam. Or dark cherry jam. Or raspberry jam. Or whatever-floats-your-boat jam. I decided not to strain the jam I used to fill the cupcakes. I did strain the jam that went into the buttercream, because I wanted a velvety smooth buttercream. 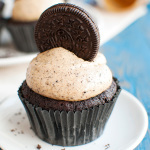 However, when it came to the cupcake filling, I decided that I didn’t mind a little texture. 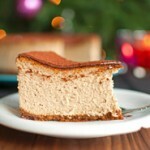 Enjoy this recipe guys! 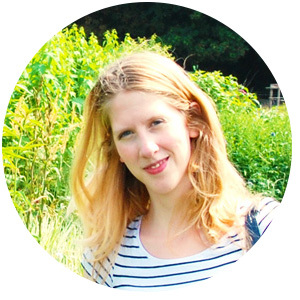 And if you would like me to send you an email when I’ve posted another recipe, click here to sign up to my mailing list! Or, if you have Instagram, I just opened an account. Just click here to follow me on Instagram! 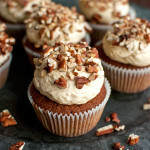 Makes 6 cupcakes, but you will probably have some leftover buttercream. The buttercream recipe makes enough to generously frost about 8 cupcakes. Preheat oven to 175°C/350°F (standard oven setting) and line a 6-cup muffin pan with cupcake liners. In a medium-sized bowl, whisk together sugars, oil and the egg (so ½ large egg). In a glass, combine hot water and coffee powder and stir until the coffee has dissolved. Add the buttermilk and the vanilla extract and stir until combined. Add this buttermilk mixture to the sugar mixture. Whisk until combined. Add the flour, cocoa powder, baking soda, baking powder and salt and whisk until the batter comes together. Divide the batter evenly over the 6 muffin cups (filling them three quarters full). 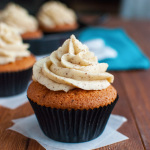 Gently rap the pan on the counter once to remove any air bubbles, then bake in the middle of the oven for 18-20 minutes, or until a tester inserted into one of the cupcakes comes out clean. Remove from the oven and allow the cupcakes to cool to room temperature. Once cool, the cupcakes can be frosted. Combine egg whites and sugar in a medium-sized heatproof bowl (or the bowl of a double boiler) and whisk until incorporated. Set the bowl over a pan of simmering water, making sure the water doesn’t touch the bottom of the bowl, and gently heat the egg mixture, whisking continuously, until the sugar has dissolved. You can check whether the sugar has dissolved by rubbing a bit of the mixture between your fingers; you should no longer feel any sugar crystals. 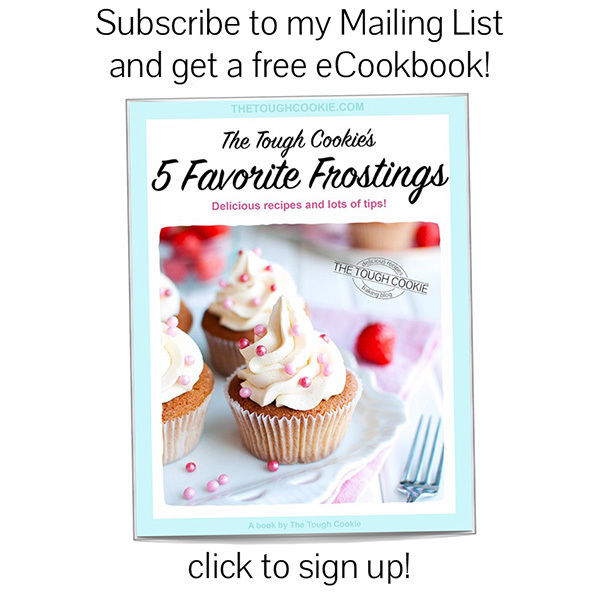 At this point, you can either pasteurize the mixture, or use the unpasteurized egg whites. If you want to pasteurize the egg whites, continue to heat the mixture, whisking continuously, until the mixture reaches a temperature of 71°C/160°F. You will need a sugar or candy thermometer, or a multimeter to properly register the temperature. If you decide not to pasteurize the egg whites, proceed with the next step. 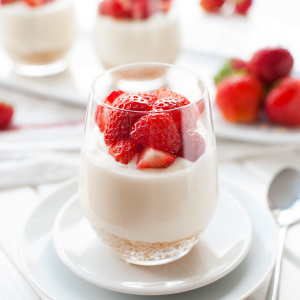 Remove the egg white mixture from the heat and, using an electric whisk fitted with the whisk attachment, beat the mixture until the resulting meringue holds stiff peaks and has cooled to room temperature. The bottom of the bowl should also have cooled to room temperature. 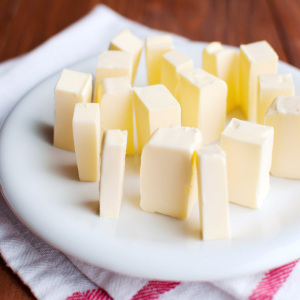 Add the cubed, softened butter one cube at a time, mixing well after each addition. If the mixture looks like it it’s separating after you’ve added all the butter, don’t panic. Just keep beating the mixture and the buttercream will magically come together again. If the buttercream is too soft to pipe, the butter was too hot when you added it. In that case, place the bowl with the soft buttercream in the fridge for about 20 minutes, then mix again. The buttercream should firm up. 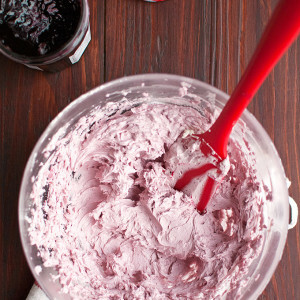 When the buttercream looks smooth and creamy, beat in the strained cassis or blackcurrant jam and mix until well combined. Use the buttercream immediately (or within a few hours) or store in an airtight container in the fridge for up to 2 weeks. 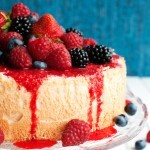 Allow buttercream that has been refrigerated to come to room temperature, then beat with the mixer until smooth and spreadable again before using it. 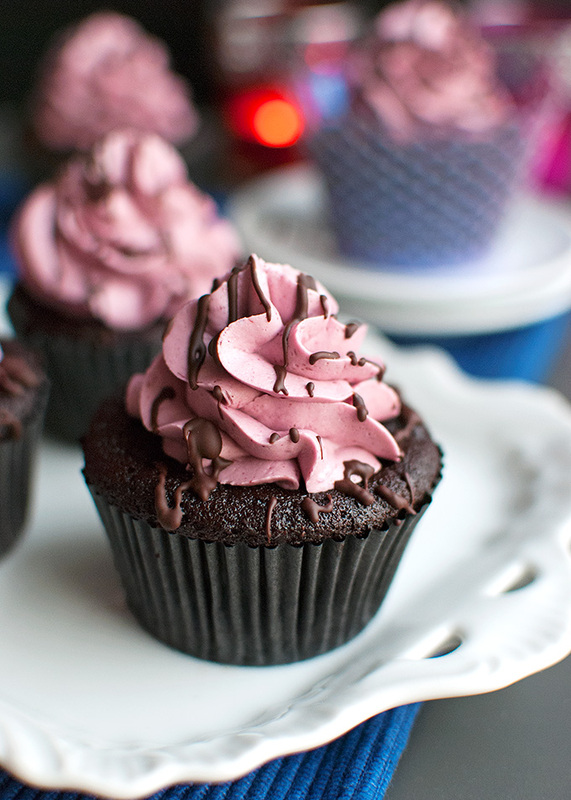 Using a serrated knife, make a hollow in the center of each cooled cupcake. Fill with a teaspoon of blackcurrant or cassis jam. Transfer the cassis buttercream to a piping bag fitted with a large star tip and frost the cupcakes with a swirl of buttercream. Melt the chocolate in the bowl of a double boiler, then use a teaspoon to drizzle the melted chocolate over the top of the cupcakes. 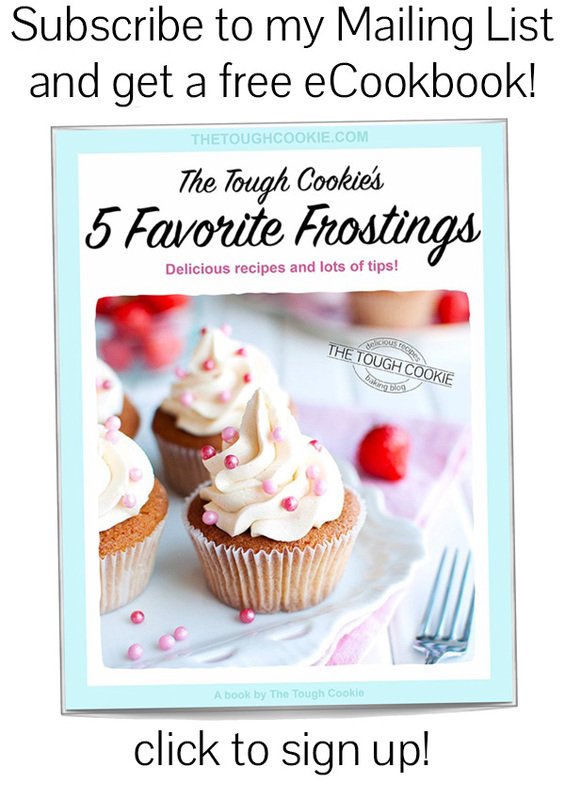 Frosted cupcakes can be stored in an airtight container in the fridge for up to 3 days. 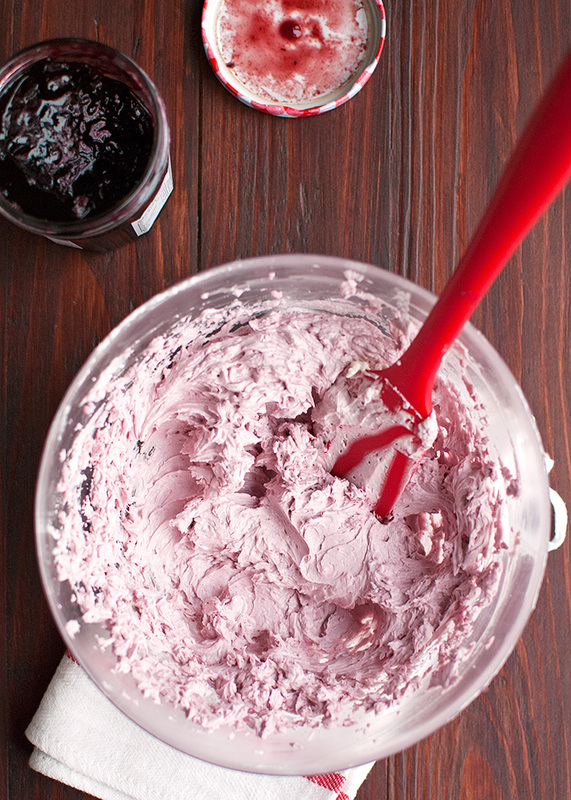 Use the leftover buttercream and melted chocolate to make cassis creams! * crack one large egg in a small bowl. Using a fork, whisk the egg until the white and yolk are well mixed, then only use half of for this recipe (28g or 1½ tablespoons). ** instead of using hot water and instant coffee powder, you can use 60ml (¼ cup) of coffee. 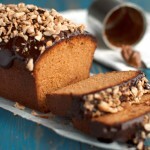 I perfectly understand what you mean with that praline/chocolate thing! I feel the same way as well a lot of times when things are called differently in my place from their ‘proper’ name. I say chocolate for that kind of chocolate though. Praline reminds me of the caramel and nut sweet. P.S. The cupcakes look lovely. 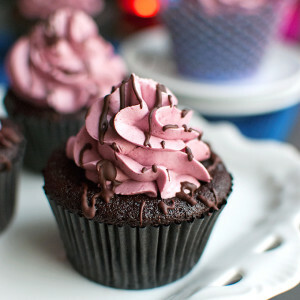 Love that mauve colour on the buttercream!